Awarded a Critic's Pick and 2 stars by The NY Times & a Critic's Pick by New York Magazine, Hill Country BBQ Market reincarnates the heart, soul, and juicy oak-smoked meats of the legendary BBQ joints in Central Texas. Grab this $49 pulse (an $88 value) for an awe-inspiring Pitmaster BBQ dinner for two, that includes 1/2 lb of brisket, 2 pork spare ribs, 2 Hill Country hot links, 1/2 chicken, 4 sides, and 2 Margaritas, Sangrias, Glasses of Wine, or Draft Beers. Highest quality cuts, simply dry-rubbed, low- and slow-smoked over real post oak delivered from Lockhart, TX until tender and moist; these sumptuous meats get you to food nirvana. Then there are the Longhorn Cheddar Mac & Cheese, the Sweet Potato Bourbon Mash, and the Campfire Baked Beans with Burnt Ends to bring it all home! With universal devotion and critical acclaim, Hill Country Barbecue Market is undisputedly one of New York City's best BBQ restaurants. 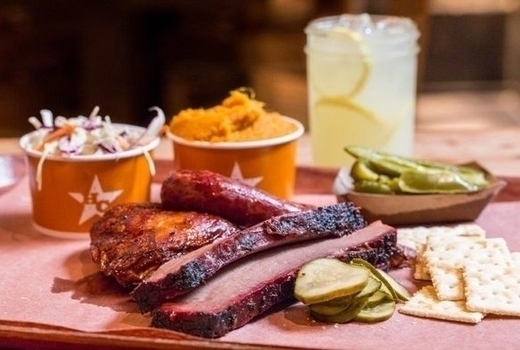 On its legendary food, Pete Wells of The NY Times has written that there is nothing else with as much "sheer power to send ripples of anticipation through the pit of my belly" - no exaggeration to its legions of fans, flocking for authentic Texas-style BBQ and smoked meats. The melt-in-your-mouth Brisket obviously gets the top billing here, but the Hot Link Sausages that snap crisply with each bite and with a deep, smokey beef flavor are just as unforgettable. Cool down with creamy Cole Slaw and earthy Collard Greens with thick curls of smoked Bacon. The country-chic dining room with rough-hewn tables, cutlery in pickle jars, trays lined in brown butcher paper and vintage photographs add to the laid-back charms. It's all from Texas, with love! 2 Hill Country Hot Links. 2 House Margaritas, Sangrias, Glasses Of Wine, Draft Beers Or Sodas (up to a $12 value each). "As a Texan, I thought finding good BBQ outside of TX...let alone in NYC, would be impossible. This is seriously some of the best BBQ I've ever had! Every time I step inside this restaurant, I feel like I'm stepping back into my home state! Make sure to get the moist brisket, mac & cheese, green bean casserole and corn muffins." 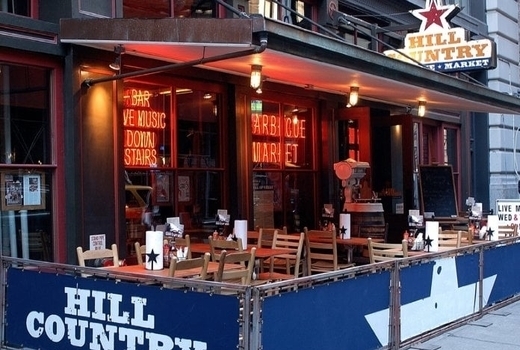 "Hill country is a BBQ wonderland where everybody comes in to visit family. The smell of the place hits you right in the feels. Great place, awesome staff. Love you Hill Country!" "I'm part of the Texas diaspora in NYC - so I seek out as much barbecue as I can find. Hill Country is the best. The meat is the real deal, and the sides are fantastic. But the best part is the vibe."